Some of you are probably on Facebook. OK, there are over a billion people on FB, so most of you are probably on Facebook. And, since this post will be on Facebook all of you there are on it. The first 5 people who comment on this status “I’m In” will receive a surprise from me at some point in this calendar year – anything from a book, a ticket, something home-grown or made, a postcard, absolutely any surprise! All you need to do is comment on the post (wherever you see it). We’ll choose our winner(s) at random times. I will be speaking at the JBN BizExpo and Networking event on July 31 in West Orange. Want to Speak to ~30 Business Professionals?? There is a free Networking Workshop, sponsored by BNI at the Bergen Community College Tuesday evening, May 24thfrom 7-9 p.m. The workshop is for busy professionals who want to generate more business referrals by improving their networking skills. 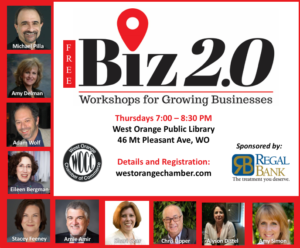 There will be a panel of business networking experts who will share tips and techniques for successful networking. If you are interested, please reserve your space by registering on-line by Thursday, May 19th at http://bniworkshopmay24.eventbrite.com as space will be limited to early registrants. Light refreshments will be offered and there will be a raffle for several business networking books. I’ve been invited to speak at an upcoming open (and free) networking event. It’s on Feb 8th and is sponsored by BNI (Business Networking International. ) It’s at Bergen Community College from 7-9 p.m. The workshop is for business professionals on “How to Leverage Social Media as a Business Marketing Tool”. Flyer is attached and link to register is HERE . Social Purchasing. Learn how, why (and) if your business should be using services like Groupon and Living Social. We’ll talk about this ‘next big thing’ in Social Media. Yes, it’s the first time you can really see quantifiable results, but is it a good idea for you? We’re offering some of our 2011 Mets tickets to our clients, customers and friends. If you’re interested, we’ll send you the password to the webpage and you can choose the game you want. If you are a small business owner, or thinking about starting a business, you don’t want to miss this seminar. Facebook has over 500 MILLION active users. Twitter is THE most popular micro-blogging site in the world. How should you take advantage of these Social Media powerhouses when promoting your business? Do it right, and hit a Home Run. Do it wrong and it can bury your company. We’ll show you how to do it right. Want to know how to be private from a personal standpoint but be very public from a business standpoint on Facebook? I’ll be facilitating an “advanced users” break-out session at the upcoming Making Time for Social Media – Breakfast/Networking event hosted by Eva Abreu. There will be a couple of different sessions, so everyone is welcome!